Heat oven to 400°F. Make pie crusts as directed on box for Two-Crust Pie using 9-inch glass pie plate. In 2-quart saucepan, mix sugars, cornstarch, salt and nutmeg; stir in reserved gooseberry syrup. Cook over medium heat, stirring constantly, 6 to 7 minutes or until thickened. Stir in gooseberries and cherries. Pour into crust-lined plate; dot with butter. Top with second crust and flute; cut slits in several places. Cover crust edge with strips of foil to prevent excessive browning; bake 15 minutes. Remove foil; bake 20 to 25 minutes longer or until golden brown. Cool at least 2 hours before serving. 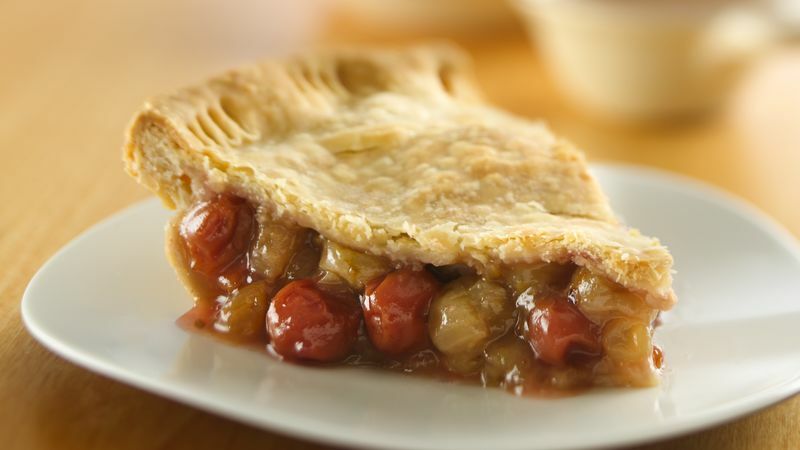 Beverly Emswiler of Lincoln, Nebraska, took 1st place with this recipe at the Pillsbury Refrigerated Pie Baking Championship, 2009 Nebraska State Fair.